Air India, which is India’s State owned national carrier, lacks a viable policy both for the domestic and the long haul sector. The airline is also devoid of a practical and commercially rewarding long-term fleet plan. There is every indication that in coming years Air India’s annual losses would be stabilising at close to USD1 billion as for FY 2014–15, its revenue, operating loss and net loss were Rs 197.81 billion (US$ 3.0 billion), Rs 2.171 billion (US$32 million) and Rs.5.41 billion (US$81 million) compared to FY 2011–12, which were Rs. 147.13 billion (US$2.2 billion), Rs. 5.138 billion (US $77 million) and Rs. 7.55 billion (US$110 million). 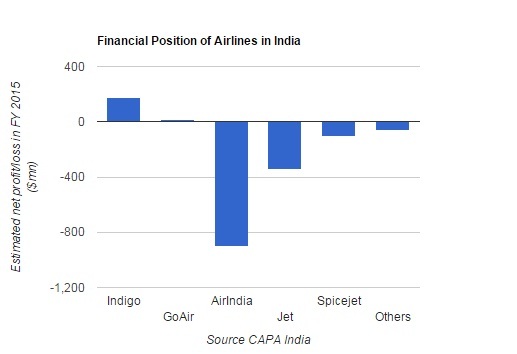 The combined losses for Air India and Indian Airlines in 2006–07 were Rs 7.7 billion (US$110 million). Following their merger, the losses went up to Rs. 72 billion (US$1.1 billion) by March 2009. In July 2009, State Bank of India was delegated the responsibility to prepare a road map for the recovery of the airline which resorted to selling three Airbus A300 and one Boeing 747-300M in March 2009 for $18.75 million to finance the debt. By March 2011, Air India had accumulated a debt of Rs.425.7 billion (US$6.4 billion) and an operating loss of Rs.220 billion (US$3.3 billion). On the other side, we have the case of Emirates Group that operates across six continents with headquarters in Dubai with an 84,000 strong multi-national team comprised of over 160 nationalities achieved its 27th consecutive year of profit. Emirates’ revenues this year increased 7% to AED 89 billion, and profit increased 40% to AED 4.6 billion. Similarly, an airline like Etihad Airways, the national airline of the United Arab Emirates, recorded the fourth consecutive year of net profitability and achieved its strongest financial results in 2014, posting a net profit of US$ 73 million on total revenues of US$ 7.6 billion, up 52.1 per cent and 26.7 per cent respectively over the previous year. The record performance, which marked the airline’s fourth consecutive year of net profitability. Till 31 March 2014, Government of India had infused Rs.132,000 million by way of equity into the Company from the time the FRP was implemented. An amount of Rs.65,000 Million was provided in Union Budget for the Financial year 2014-15. The Government infused Equity Capital of Rs 60,000 Million during 2013-14 thus brought the total paid up Capital to Rs.153,450 million. During the year 2014-15 the Government was expected to bring Equity Capital of Rs.71,060 million including the arrears of the earlier years but the Government could infuse only Rs.57,800 million. Experts point out that apart from the cash infusion, the other cost of state ownership is that it impacts policy decisions and prevents market-based reforms to protect the national carrier. Now there is a new Organisation Structure approved by the Airliine Board and there is an Oversight Committee at the Government of India Level to ensure implementation of a Turn Around Plan (TAP) and closely monitor the actual performance. More investments from the government side have made it harder to take decisions necessary to bail out Air India from its financial crisis. It has been noticed that the Government’s bureaucratic apparatus also lacks understanding and this has left an adverse impact on government response. For example, Along with demands for additional seats, the Union Civil Aviation Ministry receives requests for code shares and joint ventures. But in the absence of a clear-cut policy and dearth of expertise with relation to global airline commercial arrangements, the Ministry lacks the ability to respond keeping in perspective the prevailing trends. Lohani faces a huge challenge when it comes turning around the sick airline. Already USD3 billion has been invested under the turnaround plan to date (till mid-2015), while the carrier’s debt of over USD8 billion is more than twice its annual revenue, the funding required by the carrier is even greater than projected in its turnaround plan. TAP entails both operational and financial turnaround of the Company. Based on the assumptions on TAP, a Financial Restructuring Plan (FRP) was prepared and implemented from 1 October 2011 which envisaged aligning of the debt repayments of the Company in line with the projected Cash Flows. The HR Policy was reviewed across the Company and a new Organisation Structure was approved by the Board in order to right-size the position at various levels in the Organisation hierarchy. An integrated IT System has been put in place for improving operational performance. There has also been renewed focus on revenue generation through other services like Ground Handling Department/ Security Department by providing services to about 59 Customer Airlines at Indian Stations and Engineering Department. Peter Harbison, Executive Chairman CAPA – Centre for Aviation has spelt out in clear terms is that the only reason the airline industry has survived is that it has paid its debts when they fell due. Servicing debt has been the key to survival. No matter how poor an airline company was as an equity investment, it almost always paid its creditors. Besides, Harbison also points out: “Whether the equity owners were governments (“subsidy”) or private, most have effectively subsidised consumers in an increasingly competitive operating environment. Consequently, he points out that over the past year or so, some airlines have actually managed to break the brutal cycle of boom and bust.” Leaders in this conspicuous transformation have been the US majors, greatly aided by the tailwind of bankruptcy protection, followed closely by consolidation. Others too have scaled financial heights. IAG, transformed by strong and effective leadership; Qantas by a unique combination of transformative measures; and Japan Airlines, with no debt (in 2014, with a net debt to total capital ratio of -7%. This followed its bankruptcy filing in 2010 and subsequent recapitalisation in 2012, which has left it with a significant cushion against any future downturn). Harbison goes on to emphasise, debt will always be a vital part of an industry which has to make such large capital expenditures relative to cash generated from operations. According to UBS data, between 2005 and 2014, a range of airlines tracked allocated an average of 89% of their cash inflow from operations to capital investment annually. and on the other extreme we have Air India that sells aircrafts to service debt. In Asia Pacific, almost every major airline group is reducing its indebtedness, including Virgin Australia, Qantas, Singapore Airlines, EVA Air, Garuda, Korean, China Airlines, China Eastern, China Southern, ANA, Cathay Pacific, Cebu Air, Air China, Air New Zealand and AirAsia. Even JAL, already in a net cash position, is modestly repaying debt. These are made possible through improving earnings and in some cases, lower levels of capital expenditure (Airline Leader – Issue 31: Nurturing the piggy bank while the good times last). Closer home, The domestic aviation market share numbers for May 2015 showed IndiGo flew more passengers than Jet Airways and Air India combined. IndiGo in fact accounted for two-thirds of passenger growth. Total international traffic to/from India also grew at 9.0% in FY2015, however Indian carriers grew slightly faster at 10.2%. Jet’s growth rate was around twice that at 20.6%, with the airline accounting for close to 75% of the incremental international traffic carried on Indian airlines. CAPA in its report – Aviation Sector in India 2015, points out that In FY2015 traffic increased and losses declined but this was largely a function of lower fuel prices. With the situation remaining constant for all Indian airlines, IndiGo saw strong growth in total revenue in FY2015 which crossed USD2.5 billion. When a top-level bureaucrat was asked to comment on the performance of private airlines vis-a-vis Air India, he said besides professional merit what needs to be probed is whether or not those in Government had side-tracked the interests of Air India and were instrumental in doling out rewarding routes to the private players. Regarding the need to augment the airline fleet, this is what Lohani has to say: “So we have also decided to grow. 15 more planes shall be added to the domestic fleet in 2016, followed by another 15 that shall be replacements and would arrive in 2017. Meanwhile the international sectors would witness addition of 6 787’s and 3 777ER’s that would all arrive in 2017 and 2018. And this is just the beginning”, of course for the much awaited turn around.